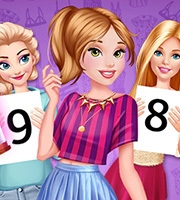 Description: Help this princess prove her fashion sense to her friends with amazing outfits! Bella is the most proper princess always and the other girls think that she should be more adventurous with her style. So they have invented a cute challenge to get her out of her comfort zone. The girls will grade Bella's look at the end. Good luck playing Princess Comfort Zone Challenge!